Tales of Maj'Eyal 1.4.5 aka "Fanning the Embers" is released! Today I am proud to announce the immediate availability of Embers of Rage, Tales of Maj'Eyal second expansion which has been so long in the making! It brings to you a whole new campaign to play (and die) in, steamtech, new classes, new races, crafting, lore, zones, quests, artifacts, .. and more! This expansion has had much sweat and blood in the making, I hope you'll like it. Embers of Rage is available from Te4.org, Steam, GOG, and more for 70 voratun coins / 7€. Go grab it while it's steamy hot! Like right now! 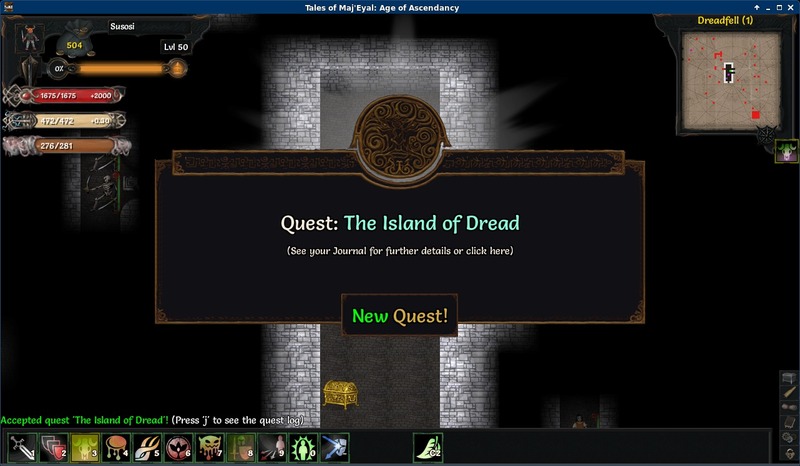 Tales of Maj'Eyal 1.4.4 aka "Once More, with Teasing" is released! This release will be required to play Embers of Rage. Update now, for Embers of Rage is out in a few days! A few compatiblity changes for Embers of Rage. "attack_recurse" also works on archery. Embers of Rage: Release date! Mark your calendars my minions! Embers of Rage will be available on the 23rd February of the year 2016 (yes that is in one week!) ! What is Embers of Rage ? It is the latest expansion for Tales of Maj'Eyal, and not a puny small thing at that! It is a whole new campaign that will take your characters from level 1 to 50 in a full set of brand new zones/quests/lore. the Yetis, well kinda! An orc mind in a powerful yeti's body! learn to maw down your foes as a Sawbutcher, dual wielding steam-powered saws to bring hot steamy mayhem to your foes! become a master Gunslinger, filling your foes with bullets fired by your steam-powered guns; be elusive, be evasive, fire away and be awesome! But what would be a good tinker without items to improve and craft ? Nothing! All tinker classes (and all other classes can learn) start with the ability to craft powerful items to improve their equipment. Do you need to run fast? strap Rocket Boots to your shoes! Do you need a quick heal? Inject a Healing Salve directly into your bloodstream! Do you love fire and flames? Strap an Incendiary Groove to your weapon! There are over 70 crafts to choose and use. 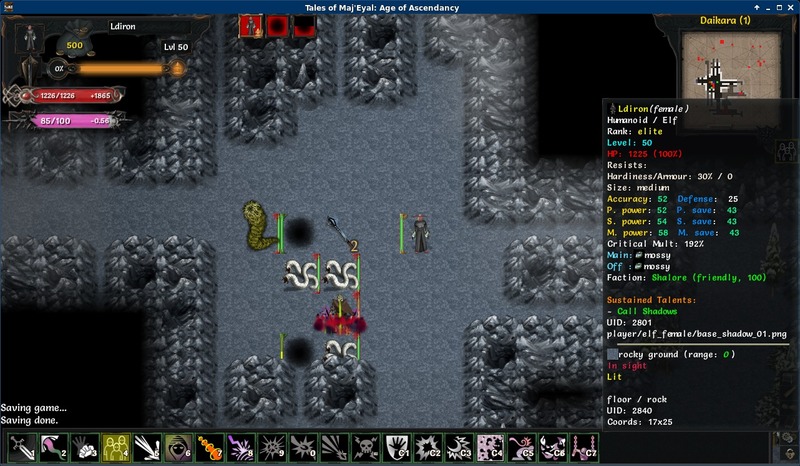 Tales of Maj'Eyal 1.4.3 aka "Before the Rage" is released! Fix Cloak of Deception buff being lost if resurrected by the Eidolon. Exiting the Eidolon plane triggers callbackOnChangeLevel. Fix Stalk talent not updating EFF_STALKER and EFF_STALKED properly when hitting the stalked target, and not triggering learning hate pool when learned. Clarified tooltip for Reality Smearing. Tales of Maj'Eyal 1.4.2 aka "Stunt Forever" is released! 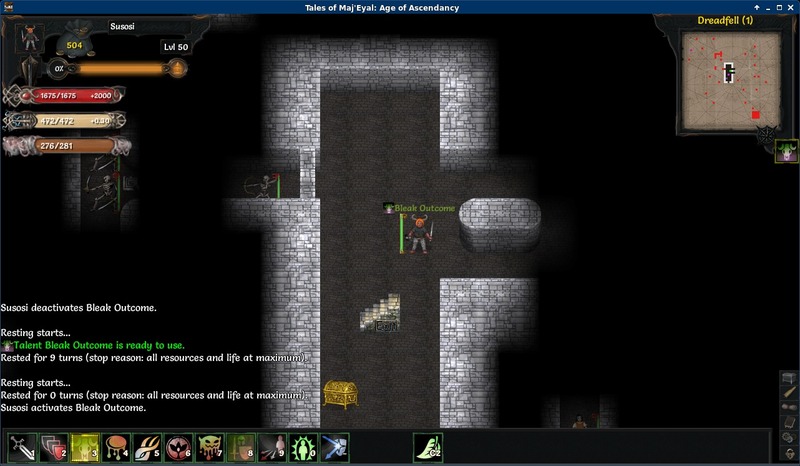 Tales of Maj'Eyal 1.4.0 aka "We are Doomed" is released! This is a major release, as such saves are not guaranteed to work from older versions, though they mostly should. If needed the game will prompt to download the old game client. Adds bleeding damage to Bone spells. New Doomed tree "Advanced Shadowmancy"
Command Staff talent available to NPCs, which will now spawn with the most appropriate aspect selected. Added the Staff Mastery talent to many casters (including bosses) that primarily equip staves. NPCs will try to equip their drops if possible. NPCs can now use item's power they have! Beware! Adjusted material tier for many znoes. New default UI skin "Dark"
Show message if player fails to move due to encumberance. Trying to force a recall from an exploratory farportal will not assume "Escape" key to mean "OK!" Make Displacement Shield have priority over other shielding so that it can actually be usefully used in conjunction with them. Updated Cyst Burst description to reflect that it can spread any disease. Adds more zone-wide effects in. About half of them explain special level mechanics, the rest are just for flavour or some minor gameplay spice. Shield damage correctly reflects no off-hand penalty. 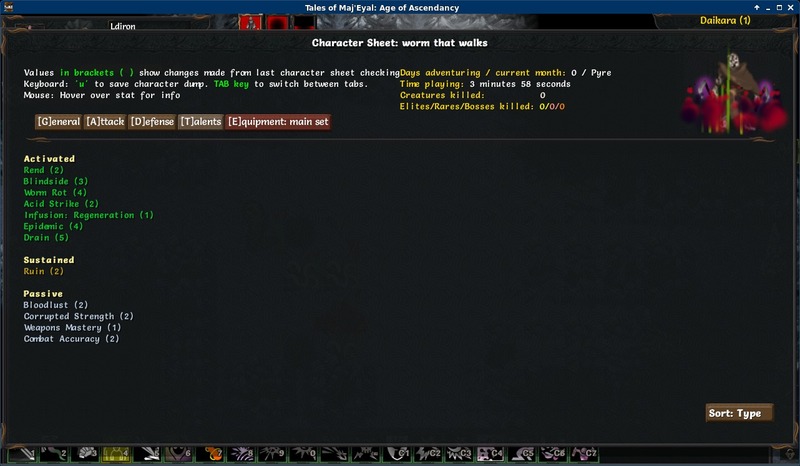 Dug sandwalls have a tooltip. Arcane Combat now interacts correctly with the Hidden Resources prodigy. Adds a center view on player key command (Ctrl-Home by default). Reworked interface Archery to properly handle multiple missile launchers. Adds some failed necromantic experiment creatures to the Blighted Ruins. Draebor is even more annoying. Makes non-player actors get the effects of their on-birth stats. Make ALL_DREAMS unlock be granted even after killing the Mindworm. Changes disease spreading code to be more general to works nicely with any future or addon diseases. Modify module() a bit to prevent leaking the global namespace into each and every module and object. 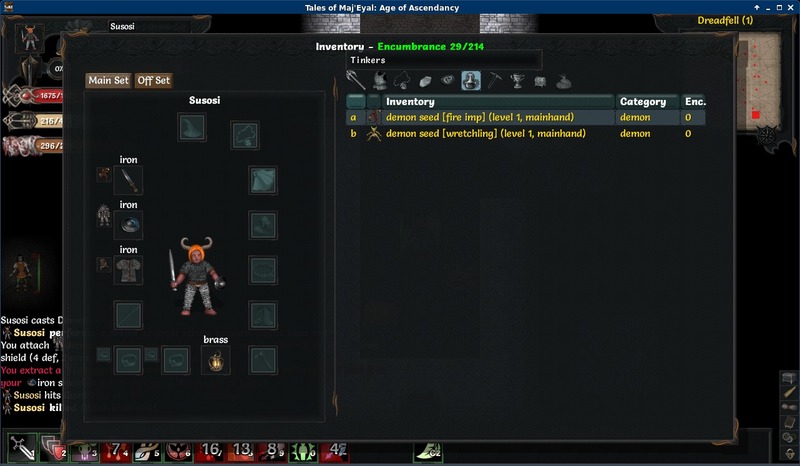 Added an options menu to the birther dialog, for addons registering to it with "ToME:extraBirthOptions" hook. Only appears if addons fill it. Added support for depleted resources canceling sustained talents (resources_def.depleted_unsustain and talents_def.remove_on_zero flags). Temporary effects on_gain/on_loose definitions can simply have "true" as the second return to make a flyer of the form +/- "effect name"
New extensible command-staff system. Possibly callbacks may be added to it, too. Fixes bugs with sleeping characters being able to change equipment (put on a lucid dreamer robe, for example), drop and pickup objects. Fixes bug allowing stealth to be used with heavy armor (by changing gear while it is active). Fixes a crash when the caustic ego corrodes armor. Fixed targetting bugs in Retch and Stone Wall. 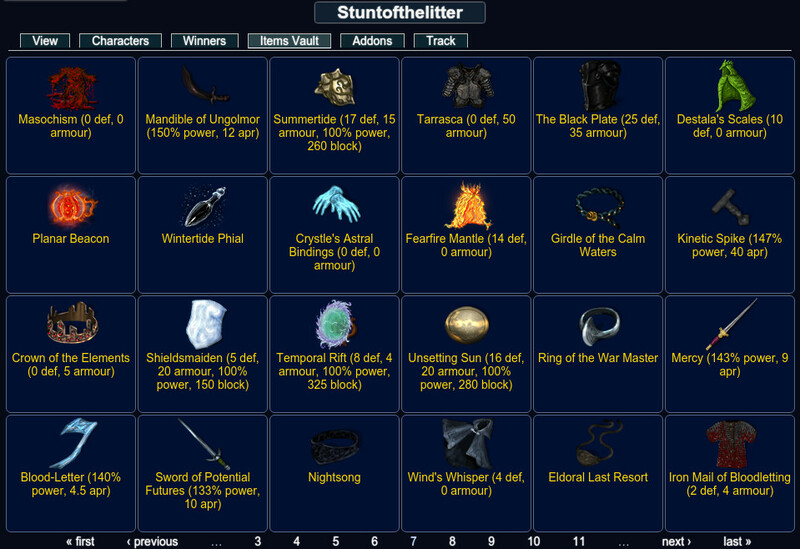 New item's vault display on te4.org! Also I randomly stumbled upon an item's vault page and thought "this looks bad! ".